Sardinia is one of the largest Islands in the Mediterranean, with Sicily, Cyprus and Corsica. It is located south of Corsica, north of Tunisia, east of the Balearic Islands and west of Italy, roughly at the same level as the Italian wine region Campania. The two main cities are Sassari to the northwest of the Island and Cagliari in the south. Sardinia had a long and agitated history. Goat, sheep, cheese and wine constitute some of the best ingredients of the Sardinian gastronomy influenced by the different culture brought by the various settlers and the many invasions of the Island. 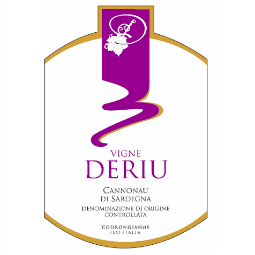 Owned by Margherita and Gavino Deriu, “Vigne Deriu” is a small estate nestled in the hills near the village of Codrongianos (south east of Sassari), in the Province of Sassari, northern Sardinia. Planted over 30 years ago on marly-calcareous soils by Gavino’s father, Filippo, the 6 hectares of vines encompasses the traditional Sardinian grapes, Vermentino and Cannonau. Deriu’s wines are pure, fragrant, vibrant and powerful and expressive. Margherita and Gavino Deriu, the husband and wife team that now runs the property family, continue with dedication and passion the work of Tiu Filippu (uncle Filippo). All the work in fact, from vineyard management to wine production, is personally performed by members of the family who, mixing traditional methods with modern techniques in the vineyards and in the cellar, produce excellent, terroir oriented wines. The 6 hectares of Vineyards of Codrongianos, a long time known vine growing area, are planted on a hill of calcareous-marly soil, conferring to the wines great complexity, length and character. Coming from vineyards planted near place Signoranna, community of Codrongianos in Sardinia (Sardegna, Italy), this 100% Cannonau was hand harvested and crafted out of a very careful selection of the grapes (the climate is actually fairly hot in Sardinia and temperatures can rise quickly, if the producer waits for full ripeness, some grapes may be burned or even cooked due to the sun, which explains the extra attention during the harvest in order to produce a rich, ripe and balanced wine with a minimum of overripe grapes). The robe exposes a red ruby color with garnet reflects. On the nose, and despite the careful grape selection during the harvest, scents of Sun dried, scorched and overripe grapes mixed with earthy, wild red and dark berries notes still emanate from the glass. However, I didn’t take that as a default, more especially from a wine coming from Sardinia, more like a non-unusual characteristic of the wines from this Sun bathed Island. Even the alcohol indicates a fairly rich, extracted and concentrated wine with 14.5%, thus not really a surprise on the nose. The palate is super jamy and ultra ripe with mature dark fruit, liquorices, touch of spice and really earthy, dark, dry finish. Overall, and it was a pleasant surprise, this wine is quite good and well crafted, soft (or rounded should I say due to the ripeness of the fruit) and fairly easy to drink with characteristic sequels of an arid land. It will be ideal with grilled red meat, matured cheese and traditional Sardinian local dishes (typical Sardinian dishes are based on grilled meat, primarily baby lamb or suckling pig, wild boar and game, but also horse rib steak or filet, and of course fish and local vegetables. The fertile soil of Sardinia is ideal to grow pretty much everything and Sardinians are so proud of their products that they rarely used food from the continent).